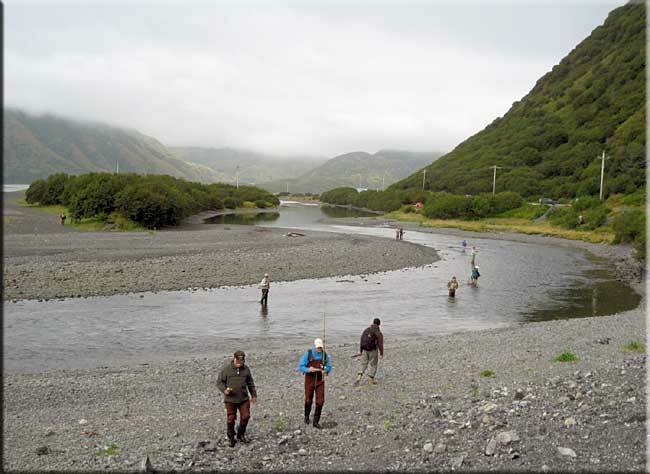 For the fourth summer, Lope and I made the journey to Kodiak Island, Alaska, to catch the September run of Coho (Silver) Salmon up its numerous short but productive streams. We have always been accompanied by at least one other fisherman, and this year Bill Talunas, a mutual Navy friend, and Ron Havers, Lope's nephew, joined us. Our flight to Kodiak was canceled the first day due to high winds, so we stayed on Elmendorf AFB in Anchorage. This base includes a large piece of wooded forest which is always productive for photography. A red fox on Elmendorf AFB. 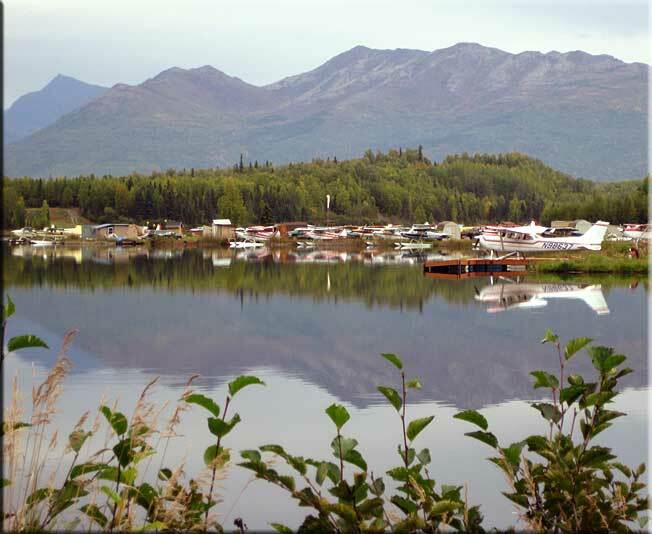 A lake on base, full of spawning Sockeye Salmon. The base flying club has a lake for seaplanes and a gravel strip for fixed gear airplanes. 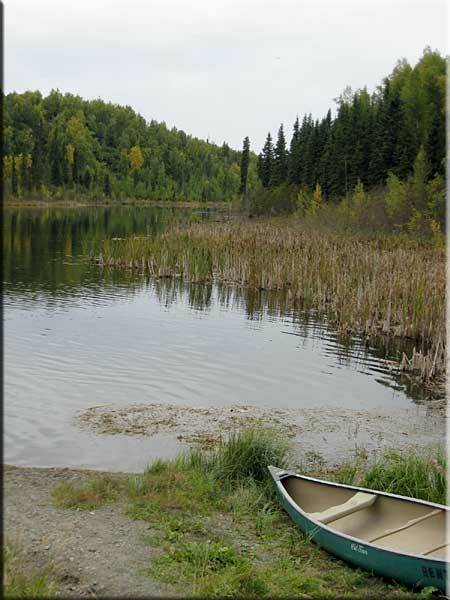 It is not unusual for club members, after work, to fly to a nearby lake and bring fresh fish home for dinner. We found light rain on our arrival in Kodiak, and, with the exception of the third day, we were to have light to moderate rain almost continually for the next four days. This swelled the streams and made the fishing more difficult than usual. 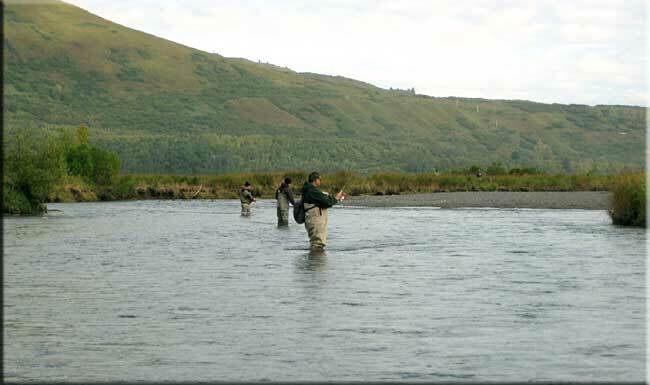 The silvers move up the streams on a rising tide in groups of three to six fish, and it is very helpful if one can visually spot the fish moving through. With deeper water, and rain spotting the surface, seeing the fish was not always possible, making the fishing much more challenging. 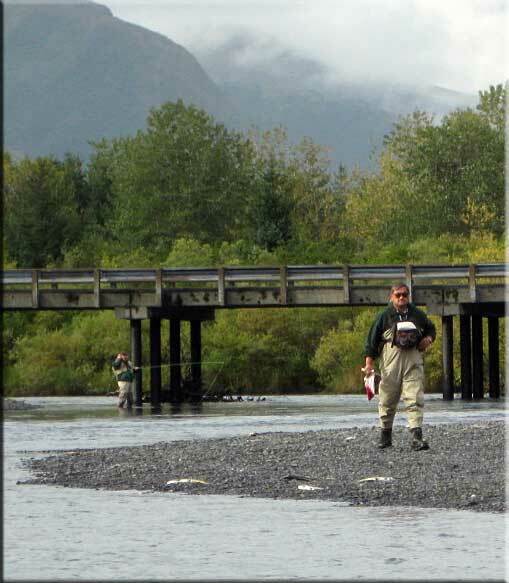 Lope walking the Olds River, a bag of cured salmon eggs in his hand. 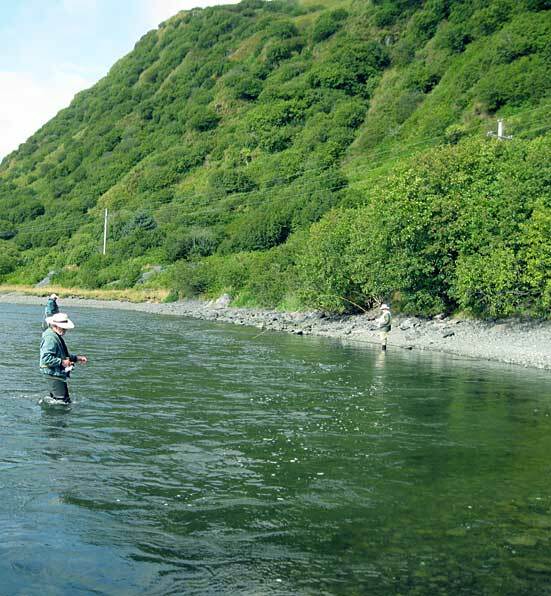 Spent pink salmon line the banks. 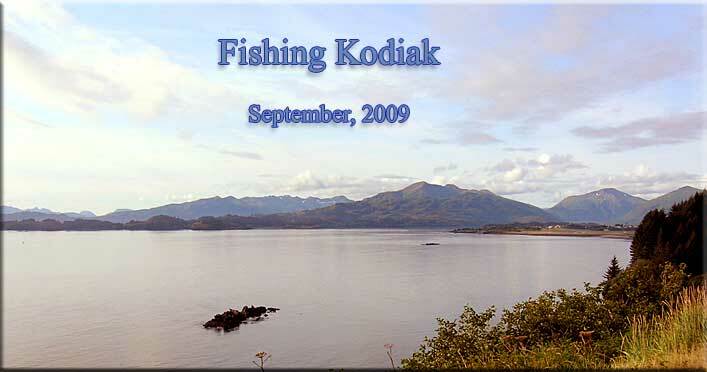 Kodiak is known for its Brown (Grizzly) bears, and they can emerge from the brush at any time. Lope had a bear encounter last summer. 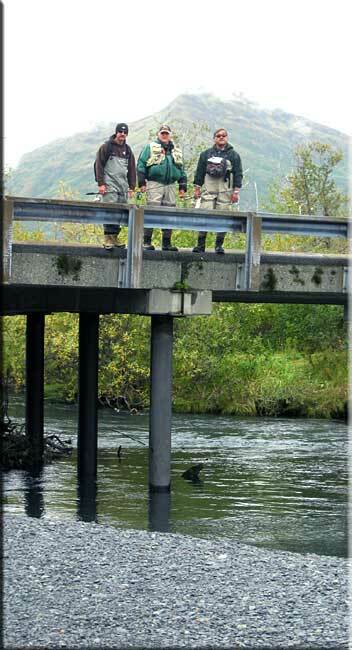 Lope, Ron and Tuna (Talunas) crowding the deeper channel of the Olds River. This is about 1/2 mile from the ocean. Ron, Tuna and Lope. Kodiak is a very mountainous island. 40 miles of road covers only a bit of the northeast corner of the island. Access to much of the extensive fishing and hunting on the island is only available by ATVs or aircraft. The Pasagchak River is near the southern extremity of the road system. Just after low tide, the fish make their run. They move quickly up stream and one gets only one or two casts before they move by. Large seals work the mouth and will take a fish off the hook if a fisherman lets a fish play too close to the ocean. Further up the Pasagchak, fisherman work the pool where the fish take their first brief break. 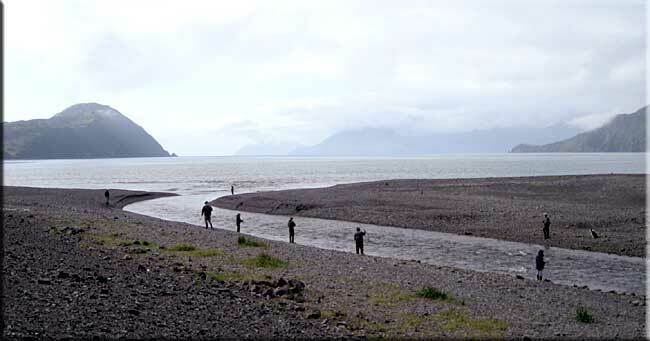 A quarter mile further up river, the fish enter a lake, where they spawn. A quiet pool on the Pasagchak. 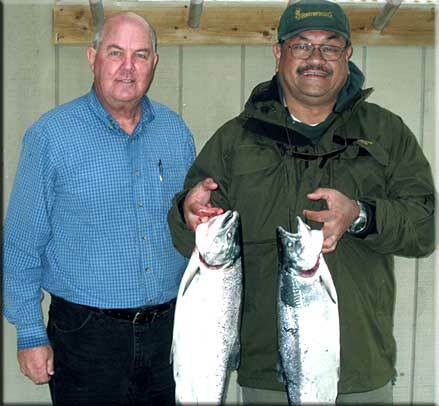 A couple of Coho hens. We averaged two fish apiece, which is fewer than normal, but we had fun trying. 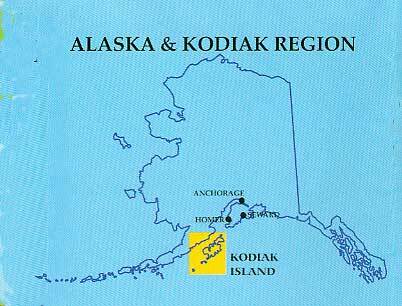 Kodiak Island lies a 40 minute flight southwest of Anchorage. Alaska Airlines and Era Airlines have scheduled service.